I was lucky enough to spend a few days in Dublin last week for work. There wasn't a lot of time for sight-seeing, but I managed to squeeze in trips to a couple of the veggie places in the city. I started off with dinner at Cornucopia, a 30 year old restaurant right in the middle of town. It's a pretty straightforward place - you get your choice of main and a couple of salads for €13.50 (~$20). 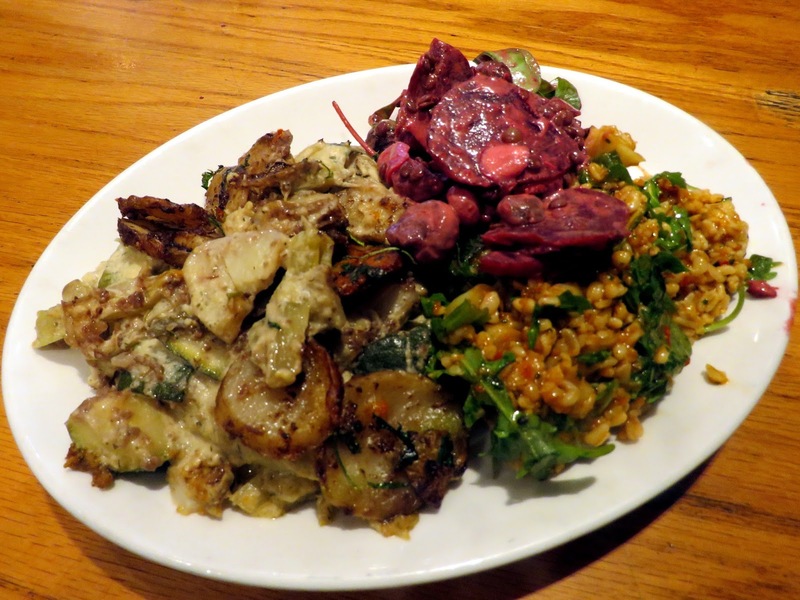 The night I visited there were options like tagines, hot-pots and quiches - I picked the hot pot, with cauliflower, zucchini and fennel potatoes, accompanied by farro and beet salads on the side. This is hearty, old-fashioned vego fare. The plates are massively loaded down with food and it's tasty and a bit stodgy. Nothing innovative, but a satisfying experience nonetheless. I was impressed enough to head back for a pre-conference breakfast one morning. You get your choice of five items plus toast and coffee for €8.95 (~$13.50). 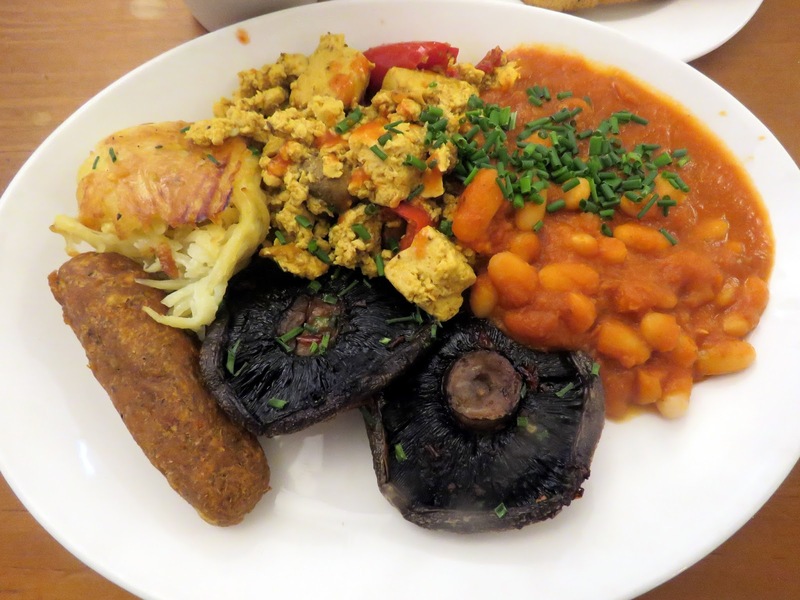 I went with beans, scrambled tofu, a hash brown, a homemade sausage and roast mushrooms. This wasn't a complete success - the hash brown was a bit soggy and the tofu wasn't bursting with flavour, but the mushrooms and beans hit the mark. It's another impressively large plate of food too, so you won't need to eat lunch. 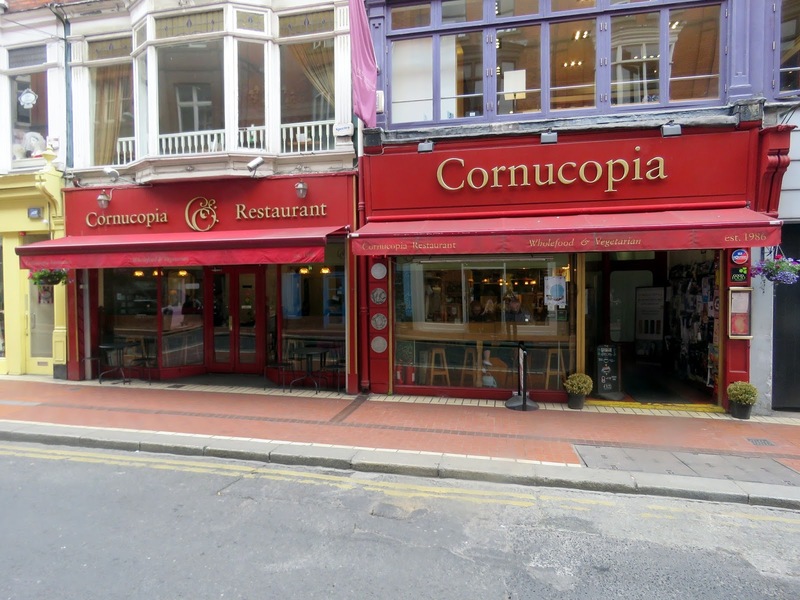 Cornucopia are doing a good job of providing reasonably affordable and hearty vegetarian food in the middle of the Dublin tourist strip - it's not somewhere that will change your life, but it's a reliable place for big plates of tasty vego food. Worth a look. For my other free meal, I headed south of the city to check out Sova Vegan Butcher in Portobello. I was expecting something trashy and mock-meat heavy, but it turned out to be much classier. They call themselves a vegan butcher because they make their own seitan, but the menu has a range of non-mock options as well. The best way to try things out is to order the set menu - an entree, main and dessert of your choosing for €24.90 (~$37). I started out with the king scallops with beurre blanc sauce, dill potato cakes, marinated cauliflower and a black pudding crisp. 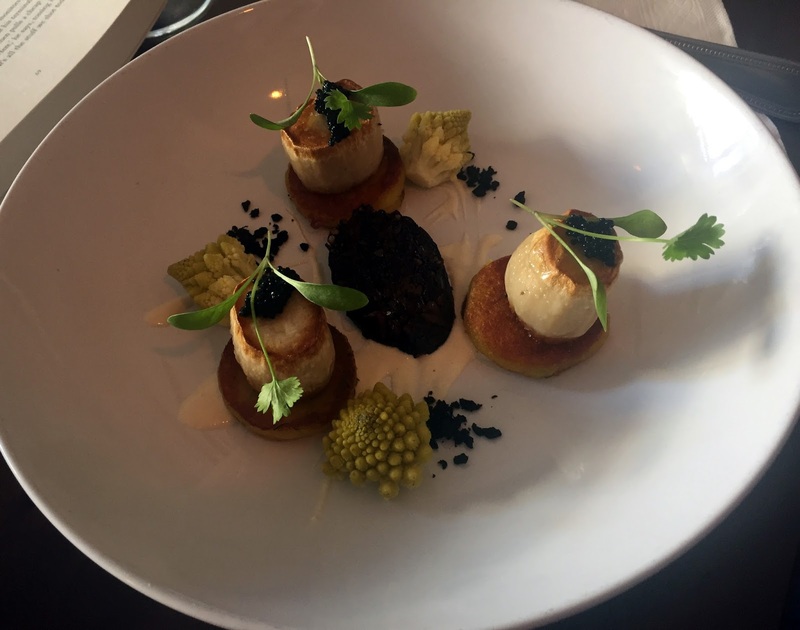 The scallops are fat mushroom stalks, dotted with kelp caviar and the black pudding is seitan-based. This is a really wonderful dish for showing off the beautiful flavours of the vegetables, but the salty, smoky seitan-crisp really stole the show for me. 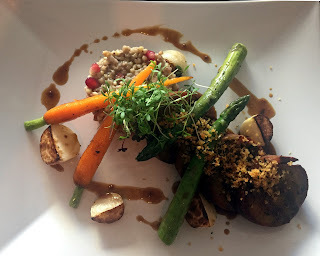 For my main I decided to embrace one of the meaty options, ordering the porc medallions with mustard jus, tarragon crust, buckwheat and jerusalem artichoke risotto and steamed baby veggies. This was another hit - the seitan pork was really excellent (almost up with Cindy's version) and you could tell that real thought had gone into the combination of sides and sauces. Delicious! I finished up with a jar of their lime cheesecake. This was the least exciting of the three dishes, if only because vegan cheesecake is such a ubiquitous offering these days. This version had a strong lime tang and a lovely texture, but I should have been braver and ordered the choc avocado mousse. Next time. Sova is really wonderful - friendly staff, interesting food and a lovely atmospheric buzz (at least on a Wednesday night). This should be the #1 priority of vegos and vegans visiting Dublin - it's fabulous. I've really let cult classic Twin Peaks pass me by for the 25+ years since it first screened. I've been so oblivious that I visited Snoqualmie Falls while in Washington last year, soaking up the scenery without any awareness that it's the most iconic landmark in the show. But some friends have brought me into the TP fold in the lead-up to series' highly anticipated third season - we've been meeting up to watch each season's premiere, studiously working through subsequent episodes at home, then reconvening for each finale. Our meet-ups are the perfect opportunity for some themed food. One of the more prominent foods in Twin Peaks is the cherry pie at the Double R Diner. Agent Dale Cooper urges every town visitor he encounters that it's "worth a stop". We're long past cherry season here, but I've always been partial to tangy jarred Morello cherries and there are plenty of recipes online that use them. I picked this one from popsugar almost at random, and was rewarded disproportionately well for my scant research. It's a recipe with a crumbly, buttery crust you can whip together in a food processor. The filling stirs up in a bowl and doesn't need any cooking before it hits the pastry. The key effort here is assembly - rolling out and molding the crust, then looping together a lattice over the top. In the oven, the pastry browns fast but the filling needs a while to set. I usually eat pies warm, but I made sure this one had a couple of hours to cool, the all-American way. It was a good decision - the cornflour sets the filling just so, it's sweet and just a little sour, and the drop of almond essence lends it a hint of cherry-cola that's absent from Aussie desserts. I cannot fault this pie! I'll make it again, and I won't change a thing about it. (Maybe one day, in a fit of generosity, I'll make it with something more vegan-friendly than butter, but that's it.) Regardless of how I feel about the third Twin Peaks season, I'll have it to thank for this remarkable recipe. Place the flour, sugar and salt in a food processor; pulse to combine them. Slice the butter into cubes and drop them into the food processor; blend until the mixture has an uneven coarse crumb texture. With the blades running, gradually pour the water into the processor through its spout, until the dough just holds together. Turn off the processor. Turn the dough onto a bench and form it into two balls. Wrap them in plastic and refrigerate them for at least an hour. In a large bowl, stir together the cup of sugar, cornflour and salt. Spoon in the cherries, allowing a bit of the preserving syrup to carry on the spoon, but leaving most of it in the jar. (I recommend flavouring soda water with that leftover syrup!) Fold in the lemon juice and almond essence. Let the flavours sit and mingle for at least 30 minutes. Preheat an oven for 220°C. Lightly spray a pie dish with oil. Sprinkle flour over a clean bench and retrieve one of the pastry dough balls. Roll it out to fit the pie dish, with a bit extra to overhang. Gently ease the pastry into the dish, leave the overhang and pop it in the fridge. Retrieve the second dough ball and roll it out so that it could fit the top of the pie with some overhang. I sliced it into 1.5 cm strips to form a lattice, but you could also leave it in a big flat sheet. Pull the pie dish from the fridge and spoon in all of the cherry filling. I was nervous about all the liquid I had, but it set up fine once this got baking. 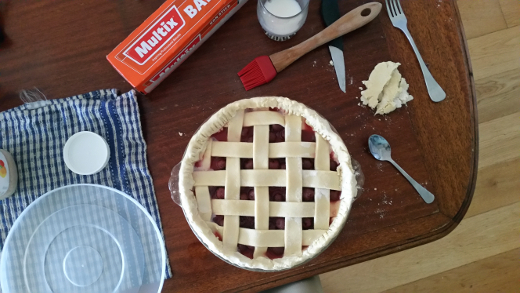 Place the top pastry onto your pie; I used the photo instructions on Simply Recipes to make my lattice. Trim any major pastry overhangs and crimp together the edges with your fingers or a fork. Brush the top of the pie with the tablespoon of cream and sprinkle it with the remaining sugar. Bake for 15 minutes. Turn the oven down to 190°C, and bake for a further 50 minutes. Keep an eye on it and put foil around the edges of the crust if it looks at risk of burning. The whole Korean fried chicken explosion that swept Melbourne a few years back kind of passed us by - it didn't seem to have too much to offer us vegos. It was a surprise then when we noticed the Gami Chicken & Beer in Fitzroy proudly advertising their 'signature' vegetarian fried chicken. The Fitzroy restaurant is a cute little place - seats for maybe 30 people, lots of bright colours and K-Pop blaring on the speakers. Once you get past the fried chicken, the menu is surprisingly veg-friendly - more than half of the 'Gami Delights' and light meals are marked vegetarian, tempting us with kim chi pancakes ($14), potato heaven ($14) and fried rice cakes ($5.50). I couldn't resist a lunchtime beer, while Cindy ordered a crushed pear soft drink, which turned out to be a sweet juice rather than a carbonated soda. They came out with a serve of prawn crackers (not vego) and some pickled radish. Our choice of side dish was mushroom mania ($16), a hot pan filled with three different kinds of mushrooms, tofu puffs and stir-fried veggies in a sweet soy sauce. This was fantastic - the tofu puffs soaked up all the delicious saucy flavours and the veggies and mushrooms hit the mark. But the main event was the veggie chicken, which we got as part of a lunch deal - 7 pieces of veggie chicken and chips with a sweet black sauce ($15). The chips were great - crispy on the outside and well seasoned and the sauce was sweet and sticky. The veggie chicken though was a bit of a disappointment - it was super chewy and a bit on the dry side. It's too bad, because the seasoned coating was good (though we hear it contains egg, making these unsuitable for vegans). We had a pretty good time lunching at Gami - the menu is surprisingly veg-friendly and I'd be tempted to come back to try the kim chi pancakes. On the downside, the main attraction - the veggie chicken - wasn't really that exciting and the menu in general isn't that vegan-friendly. I'm glad that Gami offer a vego alternative to the fried chicken, but I can't see us rushing back for another shot. I couldn't find any other reviews of the mock chicken at Gami. There are a couple of positive meatier reviews of the Fitzroy place at Eats By Donutsam and thebrunchaddict. We're not going to round up all the meaty reviews of the city branch. Accessibility: There's a step up on entry, to a fairly spacious interior. The seating is all low stools. We ordered at our table and paid at the high bar. Bathrooms are gendered and not especially accessible. In the past two months, we've tried three different services that home-deliver ingredient boxes for home cooking. This week we're running short reviews on our experiences with each one. 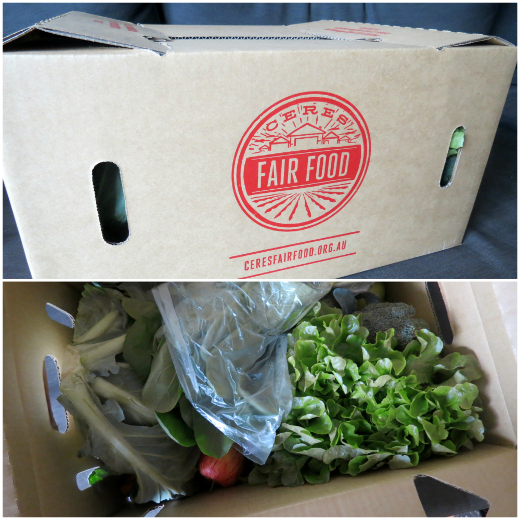 We've been ordering organic fruit & veg boxes from CERES Fair Food for years. We pay $46.75 for a small mixed fruit & veg box. It's intended to last two people a week but we stretch it out for a fortnight, supplementing it with a few extra groceries and, of course, eating out. What we received: apples, oranges, bananas, pears, carrots, potatoes, broccoli, onion, pumpkin, cabbage, spinach, lettuce. What we made: salad on lentil tacos, roasted veges (with seitan chops, then sausage rolls), soup, chimichurri pumpkin bowls, okonomiyaki, fruit as-is for snacks and juiced into soda water. Conclusions: A fruit & veg box has the convenience of home delivery and spotlighting what's in season. However, the rest of the work is on you - prioritising ingredients before they spoil, choosing recipes you'll enjoy, shopping for other ingredients, and cooking the food. Week to week, these are things us two food enthusiasts are content to do! That wraps up our recent experiences with food delivery. Do you subscribe to a service? How does it work well for you? 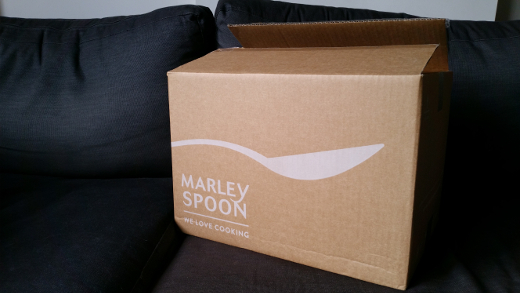 Friend of the blog @pfctdayelise gifted us a one week free trial of the Marley Spoon two-person box that they subscribe to. We received two serves each of three dinners; this would usually cost $69.90. The Marley Spoon MO is eating well without too much effort, curbing the temptation to order takeaway on work-late weeknights. What we made: warm roasted mushrooms with basmati & quinoa salad, roasted Dutch carrot salad, hearty pearl barley and sweet potato salad. The recipes were detailed enough that we could recreate the ones we liked on our own later. Substantial amounts of packaging (though they do offer some nice recycling tips on their website). Conclusions: This service is likely to appeal to busy bods who want to make healthy dinners at home while minimising the time spent meal planning, shopping and in the kitchen. In our final post in this series, we'll return to our old faithful delivery plan. 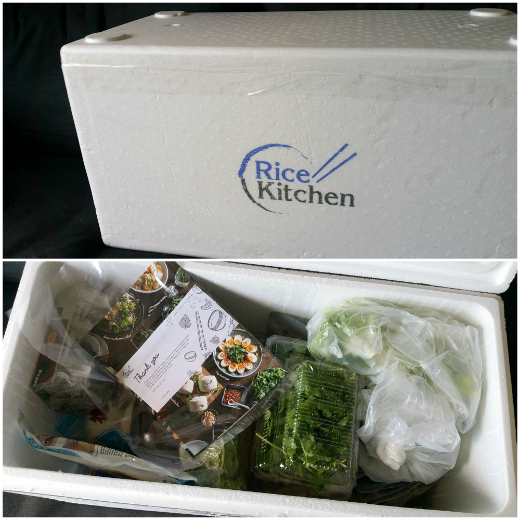 We received a complementary trial of the Rice Kitchen Vegetarian Delights Feast thanks to business co-founder Anh (we made friends as food bloggers years ago!). This delivery would normally cost $120 and is intended to cater to six people for one meal. Anh et al. describe their service as a 'DIY dinner party in a box' - it's an elaborate menu that calls for substantial preparation and encourages you to gather together the family or invite some friends over to share. 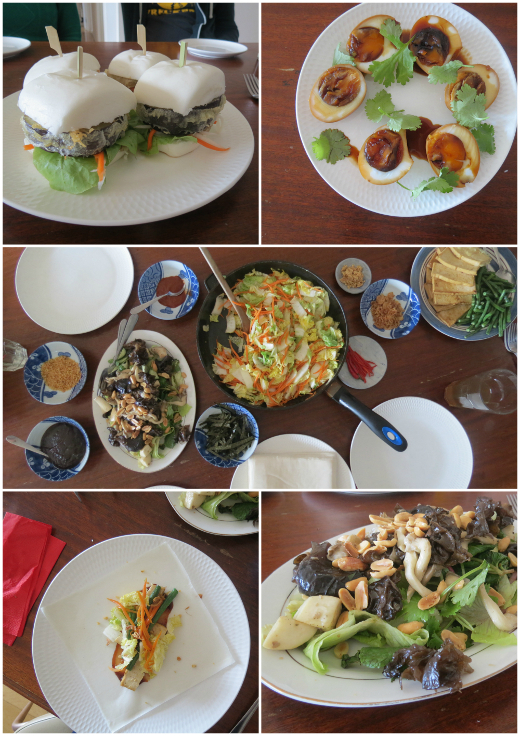 What we made: soy sauce eggs, tempura eggplant mantou buns, Asian mushroom salad, vegetarian popiah. The website and printed materials are beautiful, and definitely got me excited to cook! Everything tasted terrific! The many sauces and sprinklings were particularly good, and made the meal feel special. Due to the pre-made sauces and dressings, I could not reproduce these recipes precisely on my own without further research. Conclusions: This box is for people who don't enjoy meal planning or shopping but are willing to put effort into cooking and entertaining. It would be a fun introduction to Vietnamese cooking for a newbie who's unsure where to source ingredients. Next up: a service that's more focused on simple weeknight cooking. This soup recipe has waited more than eight years to have its moment in our home. I bookmarked it in 2008 soon after it was posted by Jac on Tinned Tomatoes, and this month it was the perfect thing for bringing together the onion, potatoes, spinach and pear that arrived in our vege box. With garlic already in the cupboard and some home-made stock in the freezer, all we had to buy was the blue cheese. It's a simple formula that I made my tweaks to. I took my time cooking the onions down to soft caramelisation, Michael left the skin on the potatoes when he chopped them, and I retained the spinach stems too. It would all fall prey to the stick blender, after all! When that time came, my soup wasn't as gloriously green as Jac's, and I needed an extra cup of water to smooth its way. In our khaki soup, I was surprised how easily I could pick out the pear's sweetness from the pungency of the blue cheese, and the thick carbohydrate comfort of the potatoes. It was a comfort and a pleasure; well worth the wait. Heat the oil in a your largest saucepan over low-medium heat. Add the onion and saute it gently until soft and sweet, about 10 minutes. Stir in the garlic and cook for 2 minutes. Add the potatoes and cook for a further 2 minutes. Add the spinach and cook until wilted. Add the pear and pour over the stock. Place a lid on the saucepan and cook for 30 minutes. Crumble in the blue cheese and stir until melted. Season with Worcestershire sauce, salt and pepper to taste. Blend until smooth with a stick blender. Pour into bowls, garnish and serve. The Snug has been promising weekend breakfasts ever since they introduced their vegan menu last year, and they debuted mornings this month! Sharp-eyed Michael noticed it from the street within two hours of opening but I kept him waiting further 23 before letting him loose on the Big Breakie ($19). This is an enormous shallow bowl with sourdough toast and margarine, two rashers of the best streaky facon, a Tofurky sausage, scrambled silken tofu, grilled mushrooms, a golden hash brown, tub of baked beans, and bonus unlisted grilled cherry tomatoes. Michael attacked it with gusto, saw the meal through, and skipped lunch entirely as a consequence. I took a little more time to choose than Michael. Fruit toast excepted, the menu is all savoury, and it's dominated by carbs and mock meats. On another day I'd be drawn to the Facon Butty or the BLAT; there's also Bacon and Eggs (facon and scrambled tofu) for those who like to mock the simple things. But I was on the lookout for something a little lighter, and picked out the corn fritters ($16.50). While they were indeed studded with corn, the fritters were dense (perhaps based on chickpea flour or mashed potato? The Snug team have since told us they're polenta-based) and almost certainly deep-fried (actually grilled). They sat atop a generous portion of avocado, and were garnished with a cheery fresh tomato salsa. The side of lemon-dressed baby kale and spiralised veges looked intimidating and chewy but was actually terrific. On that basis, I'd assume that nothing on the menu qualifies as 'light'. Really, it's as we should expect from an Irish pub whether it's vegan or not: hearty fry-ups best enjoyed the morning after a night sampling their beers or, in Michael's case, after an early morning bird-watching on an empty stomach. 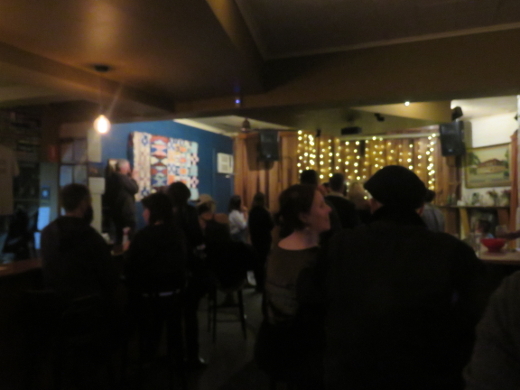 You can also read about one, two dinners we've eaten at the Brunswick Snug. Accessibility: The interior is crowded, with a mix of tables and high seats at the bar. The courtyard has bench seats and stools. We ordered at our table and paid at the high bar. 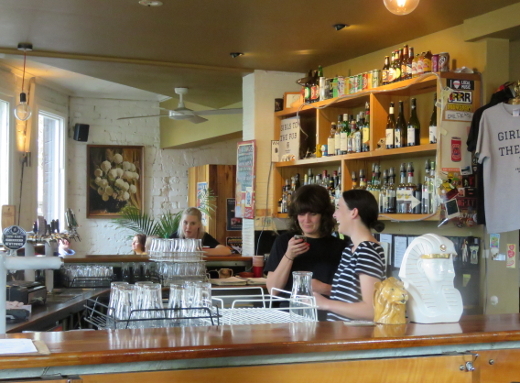 We used to love The Tramway Hotel, it had fancy burgers with vegan options, an open fire and relaxed vibes. The pub changed hands a few years ago and shifted direction slightly, but we'd heard good things about the new menu and have been meaning to go for ages. On Sunday arvo we had the perfect excuse - our friend's band Crop Top were playing a gig, meaning we could combine punk rock and vegan junk food. The menu is very veg-friendly, with a couple of vegan burgers and a vego one, heaps of sides and a vegan sundae for dessert. We went a bit crazy and ordered way too much food. 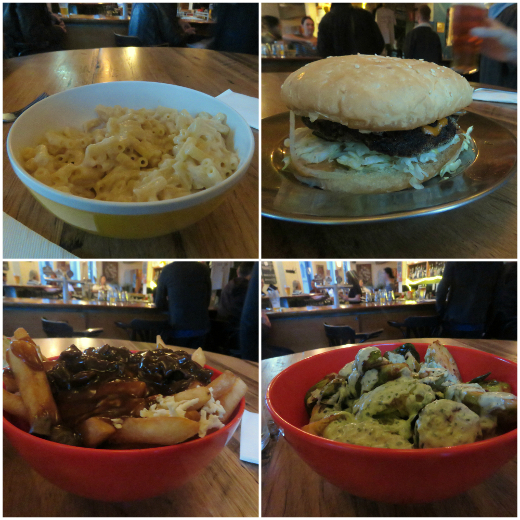 Cindy couldn't resist the vegan mac and cheese ($12) and friends recommended the vegan mushroom poutine ($16). Foolishly, we also ordered a vegan whipper burger ($15) and the chipotle fried brussel sprouts with lime and coriander aioli ($12 - we weren't sure if the aioli was vegan or not). The poutine was out of control, with fat chips slathered in a chunky mushroom gravy and heaps of grated vegan cheese. The mac and cheese was super creamy - I'd have kicked it up a notch with some hot sauce, but we still managed to plow our way through it all. The whipper reminded me more of a Big Mac than a Whopper (although it's more than a decade since I've eaten either) - the bean and mushroom patty was ace, and the pickle, onion, lettuce and special sauce were perfect fast food accompaniments. The sprouts were a welcome serve of veggies, with a tangy, spicy aioli - they weren't quite as well roasted as I'd have liked, but they still did the job. 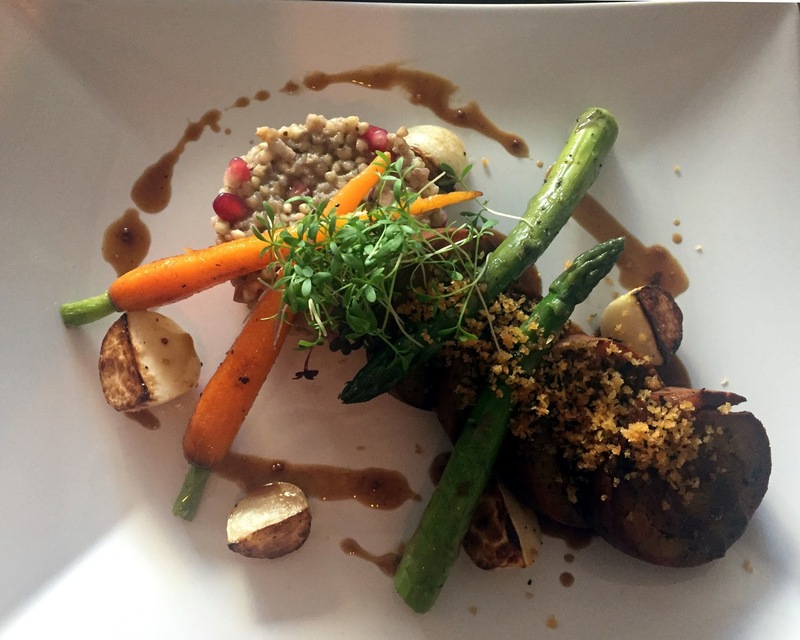 The Tramway's new(ish) incarnation is just as successful as the old one - the food is junkier (in a good way), with superb vegan options. There's a great range of craft beers, a steady stream of local bands playing gigs and a good vibe about the place - it's a brilliant local pub and one we'll be visiting again soon. Read about our visit to the old version of The Tramway here. 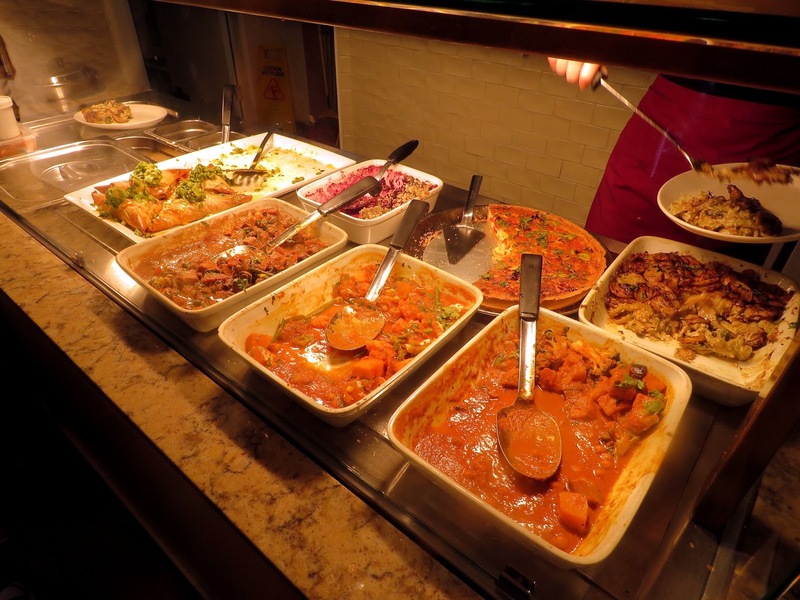 The only blogger who's reviewed the Tramway since it changed hands is The Lentil Institution, who loved it. Accessibility: There's a small step and a fairly narrow door as you go in, but plenty of space inside. Ordering and payment occurs at the high bar. The toilets are outside through a fairly narrow courtyard, and not particularly roomy. We chose these Street Vegan empanadas as a cooking project last weekend. They're certainly a commitment: there's pastry dough to make, a chimichurri spice paste to saute the tempeh filling in, a sweet paprika-spiked glaze, some slightly fiddly assembly and a relish on the side. We made it a team effort. There were a couple of recipe tweaks along the way, making the most of the sweeteners we had on hand and cooking down the onions a long time to make the relish sweeter still. The pastry has an unusual addition of silken tofu and is a huge bother to roll. I must admit that it baked up awfully well, though - a bit of crunch, a bit of crumble and a lot of toasty comfort. The glaze added some welcome brightness of colour and flavour to the hearty pastries, but there was far too much of it and I've reduced the quantity accordingly in the recipe below. I feel ambivalent about these empanadas - they're very enjoyable, but their flavour isn't as complex as the range of ingredients that make them up. They take a lot of time and a fair number of dishes. I'll admit, though, that they entitled me to plenty of smugness when I toasted leftovers in the sandwich grill at work on Monday. Begin with the dough. Place the flour, salt, coriander and chilli flakes into a large food processor. Process them for 10-20 seconds to mix the dry ingredients well. Blend in the margarine, then the tofu, then 1/4 cup cold water, until just combined. Turn the mixture onto a sheet of plastic wrap and gather it together into ball. Wrap the dough up and refrigerate it for at least 30 minutes. Next, prepare the relish. Pour the oil into a frypan over medium heat. Add the onions and saute them until soft and sweet, about 20 minutes. Add the garlic and pickle, sauteing for a couple more minutes. Turn down the heat and stir in the mint, malt syrup, tamari and vinegar. Cook just until the mint has wilted, then turn off the heat completely and transfer the relish the another container. Time to make the filling. In a spice grinder or blender, briefly blend together the oregano, parsley, garlic, jalapeno, vinegar, pepper, salt and 1/3 cup olive oil. Aim to mix everything together but let the texture of the chimichurri remain a little chunky. Heat the remaining 2 tablespoons of olive oil in the frypan previously used for the relish. Add the tempeh and carrots and saute them for about 4 minutes, until the tempeh begins to brown. Pour over the chimichurri mixture and stir it through, cooking for another 3 minutes. Turn off the heat and allow the filling to cool to room temperature. To make the glaze, whisk together all of the ingredients in a small bowl. When you're ready to assemble the empanadas, preheat an oven to 180°C. Line a large baking tray with paper. Lightly flour a clean bench, and use it to roll out the pastry dough to 2-3mm thick. Cut the dough into 10cm-diameter circles using a biscuit cutter, large glass or similar. Spoon 1-2 tablespoons of filling onto each pastry circle. Dribble a bit of water around the perimeter of the dough, and fold it into a semi-circle, crimping the edges together with a fork. Repeat with the remaining pastry circles, and pull together the pastry scraps to roll again and make some more. Transfer the empanadas to the baking tray; poke a few air holes with a fork and brush them generously with the glaze. Bake for 15-20 minutes, until golden brown. Serve the empanadas with the mint-onion relish on the side. We've become pretty lazy Brunswick brunchers lately, more often than not stumbling around the corner to the ever-reliable Wide Open Road. This weekend though we decided to try to recapture our more adventurous spirit and check out somewhere new. I'd been meaning to visit Kines ever since Keeden left Sonido to open it up. It's a nicely renovated warehouse space just off Sydney Road - they've made it comfy without going over the top, meaning there's a kind of ramshackle charm to the fit-out. The menu is full of interesting options - pickled beetroot sandwiches, vegan-friendly toasties, kim chi pancakes, creamed corn and more. It's pretty vegan-friendly by default and they're happy to tweak things on most dishes to cater for dietary requirements. The link to Sonido is strong, with arepas popping up across the menu. The coffee (using Seven Seeds beans) is fabulous, but Cindy was more excited by the possibility of ordering a Milo ($4). It turned out to be a massive jar of milk with a ludicrous amount of Milo in it - almost a meal in itself. Food-wise I went with a vegan option, a cold soba noodle salad with an avocado and sesame dressing, cherry tomatoes, spring onions, cucumber, gamasio, black sesame and baby spinach ($16) plus a side of their house-pickled chilli ($2). This was a great reminder that I really love soba noodles (I had the same experience at The Glass Den). These were particularly impressive with the creamy avocado dressing carrying a nice, strong sesame flavour and the cucumber and tomato providing bursts of crunch and freshness. It might have been a little plain on its own - I'd definitely recommend the chilli for a bit of added punch (or you could add kim chi instead, which would work brilliantly I'd guess). 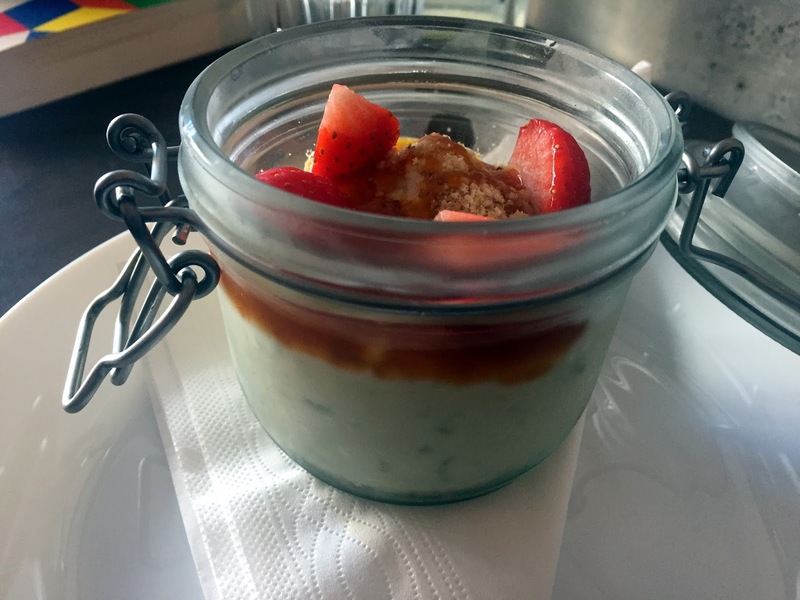 Cindy was a bit disappointed by the lack of sweet options on the offer, settling for the Kines muesli (puffed quinoa, puffed rice, roasted seeds and nuts, dried figs, gojis plus fresh strawberries and pear, $13), with a scoop of Coyo ($2). The gluten-free blend is crunchy and nutty and felt less filling than oats, and Cindy appreciated the fresh fruits too. We were really impressed with Kines. Its menu has a few departures from the standard offerings, there's great coffee and a lovely vibe. It's especially nice to go somewhere on a Saturday morning and feel like it's okay to sit and take your time over your meal. We'll definitely be back. We couldn't find any blog reviews of Kines as yet. Accessibility: The entryway was flat and the interior was reasonably spacious, with a mix of high and low tables. There's table service and then you pay your bill at a low counter. We didn't visit the toilets.